20' x 40' In-ground Bone-shaped Pool! "Someone once said that the easiest way to judge a person is to watch how he treats an animal. If this is true, then the staff at Lucky Puppy must be judged as thoughtful and dedicated individuals who are truly passionate about caring for dogs. ...And when we pull up to the driveway each morning, she impatiently claws at the car window to be let out so that the fun can begin! The people who work here are, of course, what makes this daycare so special. Brenda and her staff treat each dog as if it were their own, and this attitude means I never have to worry about Isabelle; I always know she's happy and having a great time. I feel truly lucky to have found this place and am so thankful that there are people like Brenda and her staff who willingly put so much love and dedication into what they do!" 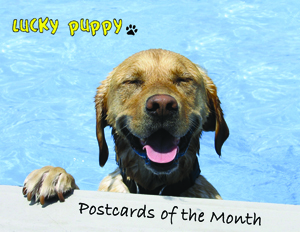 "Fellow Pet Lovers, Lucky Puppy has been the most exciting thing that has happened to our family for our dog Gretta. Gretta is a Viszla, a "strange breed" of dog with a different unique personality. I have left her at the "pound" a couple of times before and it was a nightmare for both of us. Not only that but it is very expensive and definitely not worth it. I have had people stay at my house with her and between worrying about my house and the fact that it seemed no one really stayed here with her often enough, I decided I just would not leave her much anymore. I even considered taking her with us on trips and hotel stays . . . crazy, not fun for either of us..."
When my husband, Burdett, brought me Brenda's card, it was the beginning of a great friendship not only between Brenda and I but especially for Gretta and all of the new friends she has made. She gets exercise and swimming (which she loves). She is learning to get along and relax and I don't think she could ever get enough love. She is excited to go and doesn't get too worried when she sees us packing our suitcases. She is safe and HAPPY. I have not even mentioned the other issue which is medication. Gretta is on a fairly regulated diet and takes a pill every morning for incontinence. Every other time I have left her she has had problems with accidents when I return home. When she stays with Brenda—she comes home the same—not many accidents at all . . . . ! Oh wait—one more thing I love even though I enjoy visiting the farm—Brenda picks up and delivers my Gretta to me when I can't get to her. I could go on and on "but will stop here." "I just wanted to say thanks for taking such awesome care of Bounce. You made me never worry about her when we were gone. And also thanks for helping me bring her back to a good puppy when she got a little crazy. Don't worry, we will definitely come visit, we both love you and Lucky Puppy too much to not see you again. I think it's an amazing business and way of life you have created and you inspire me to follow my passions the way you do. Stay true to what you know God has helped you create. We will miss you and the gang." "Brenda, we received our postcards from Indy today - they are awesome! We are running out of room on the fridge! Our little blue plastic pool from Kmart just doesn't cut it anymore. she can't wait to see you and get back in the big pool next month." "Brenda, This is to cover the one day Buster was with you this week. Buster asks that you tell Copper, Holly and especially Mable that he says Hi! & that he misses all of you. He plans on being at Holly's party. That's all he's talking about! Thanks again Brenda for all you do, not just for Buster, but all your dogs. You make a world of difference in all our lives!" "Just a quick note to thank you for taking care of Nandi while we made our recent move from Toledo to San Antonio. We wanted to let you know how fortunate we felt to leave her in your care knowing that she would be looked after and loved just like we do. We are moved into an apartment here, and while it isn't the same as our house in Toledo, it does have a nice walking trail through the woods attached to the property and just a few minutes away is a big off leash dog park and more trails so Nandi is having fun exploring. Here is a picture of Nandi and Campbell at a recent outing to the park. She is adjusting well to all the new smells and sounds of the city. I don't know if we will have her up north again, but if we do, we will make sure and stop by." "Thank you so much for the pictures -- I'm so happy that he has such a great time at your place. You guys take such good care of him I never feel worried while I'm gone when he is at Lucky Puppy." "Dear Brenda and staff, we can't thank you enough for what you all did for us at such an unfortunate family emergency due to a death in the family. You were a blessing to us when we needed it most as we live four hours away in Gaylord. Our boys had such a wonderful time at your retreat for dogs and Rudy and Rocky were indeed very "Lucky Puppies." 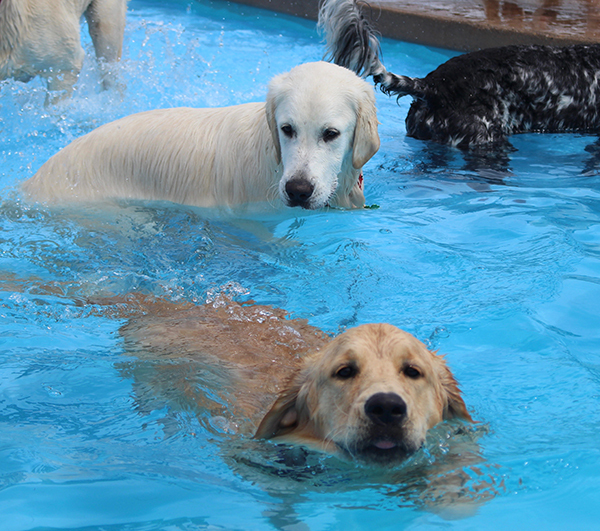 They had a terrific time with all the other dogs and the activities provided, it's like heaven for dogs. We had heard so much about you from our son and his wife when they used to have Bud stay with you in daycare, until they moved out of state. We will bring the boys back again that's for sure. Once again, thanks so much for all you and your wonderful staff did for our pups and may God bless you all." News: The In-Ground Pool is here! Click here to view our pool videos on YouTube! To provide the services necessary to create, or maintain, a sense of balance and well-being in every dog's life. What will your best friend's day be like? Bring them back to our home (with 13 acres) and provide them with a fun-filled day. Swim in our new in-ground bone-shaped pool! Play "Jungle Pup" in our 1 acre "jungle"
Enjoy a walk through our 7 acres of "Nature Trails"
Return him/her home with a smile GUARANTEED! Please Note: During severe weather, our activities will be conducted in our climate-controlled indoor playgound. Can't get your loved one to us? We realize some people work extremely early and would have a difficult time meeting with us or bringing their pets to us. Transportation IS available for daycare and emergency vacations! Safety harnesses will be used for transportation upon request. Pick-up times and locations will be worked out on a first come, first serve basis. Send your best friend on his/her own vacation! We love it when our friends stay over for a slumber party. Our vacation guests are all treated with the utmost tender loving care. They will spend the day on our 3 acre playground, and in the evenings, they will enjoy one-on-one attention as if he/she were a member of our own family. 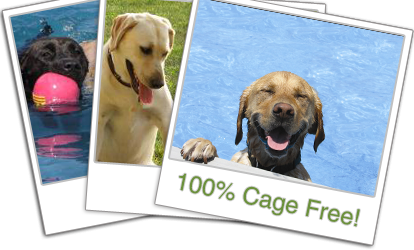 You will receive a 30% discount for additional furry family members. My dog is older and can't participate in active play, what happens then? No problem! The older dogs can either hang out in the office and play with our friendly office staff, or help the Pack Leader supervise the playground. Daycare guests normally do not need a meal, however puppies or special diet guests can provide their lunches in a marked container. For vacationers, please bring a plentiful supply of his/her own food in a marked container/bag. We would prefer not to change foods due to the fact that it may upset his/her tummy. Your dog will be extremely active and may need a little more at mealtime than usual, so please make sure you pack enough, and of course, any leftovers will be returned. If you do run out of food, we will provide a delicious home-cooked meal of rice, chicken broth, and chicken chunks at the cost of $5 per meal. I only see a split-rail fence; is my dog going to walk right out of there? It may look that way in some of the pictures, but rest assured there is welded wire fencing behind the split-rail fence. If your dog has a history of fence jumping, this may not be the best situation for them. How do I enroll my best friend in Lucky Puppy Country Doggy Daycare? Contact us by phone (734) 587-8779 or by e-mail bren@myluckypuppy.com and we will set you up for a temperament test. During the assessment, we will introduce your dog to the pack slowly (one dog at a time) and watch for any signs of aggression by observing his body language and body posture. Once your dog passes the temperament test, we will complete the application process; give a tour of the facility; fit your dog with a break-a-way safety collar; and get them scheduled for playtime! What vet records will I need during the application process? We currently require that the following records be faxed to us, by your vet, at (734) 587-8800 before we introduce your dog to the pack to ensure the safety of our guests. My dog is aggressive, can they still apply? No. It is important to us that we put the safety of all of our guests (as well as employees) first. If we begin to allow aggressive behavior, we cannot ensure the safety of other guests. That is why the face-to-face interview is so important - to be able to determine whether your pet would be able to come play with us. *Discounts are limited to one per visit. Prices for sessions are outlined in the program details for each type of instruction. Please Click Here for more information.